Our favorite anti-dark-sided God Warrior is milking her fifteen minutes for everything it's worth. 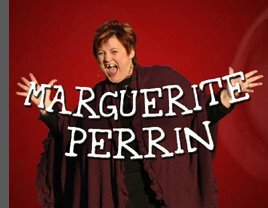 Visit Marguerite's website to see what she's been up to, and you can even purchase her new single "Why Can't You Be Sweet." Yes, I said new single... girlfriend's a rapper. You would think she would get that tooth fixed.